Throughout southern Asia, most communities follow the Buddhist way of life. Buddhists do not think of death as the end of a life, but as the end of a life cycle, and around 96 per cent of Cambodians practice Buddhism which influences the way in which they treat death and funerals. In parts of Cambodia, wooden ‘spirit houses’ are erected in front of homes, from the poorest to the richest. The huts are places where food and drink are left for the souls of departed relatives. The food is left to help refuel the spirits. Death customs throughout Cambodia follow certain rituals. When a person dies, the family look after the body. They wash it and dress it before placing it in a coffin. A post mortem doesn’t take place, or organs removed, as Cambodians believe this would have a negative impact on the departure of the soul and rebirth. Bodies are also not embalmed. Monks go to the home and recite sermons every evening by the side of the body. The coffin is surrounded by flowers and photos of the deceased, and white flags, called white crocodile flags, are hung outside the home to show that someone has died. Three days after the death, the departed is taken to a crematorium in a funeral procession which includes a priest, Buddhist monks and members of the deceased’s family. The crematorium is usually on or near temple grounds. On some occasions, such as the death of celebrities or high officials, a crematorium is built to accommodate the crowd. Mourners wear white, which is the colour of grief in Cambodia, and they also shave their heads. In some cases, the oldest daughter may drop coins behind her back during the procession. Women also stop wearing make-up because it’s considered disrespectful to the deceased’s family. The body is cremated and the ashes are collected, cleaned and kept in a stupa in the temple compound. They are closely observed by monks whose role is to help the soul pass into the afterlife. Some families keep the ashes at home. Other people have a piece of their beloved one’s bone or tooth gilded as amulets and worn around their necks. Seven days after the service, and then 100 days after, another ceremony is held to honour the departed. This usually takes place in a temple which includes giving alms and praying, but sometimes it’s at a family member’s home. Many Cambodians believe that all life evolves in a successive cycle of birth, old age, sickness, death and rebirth. 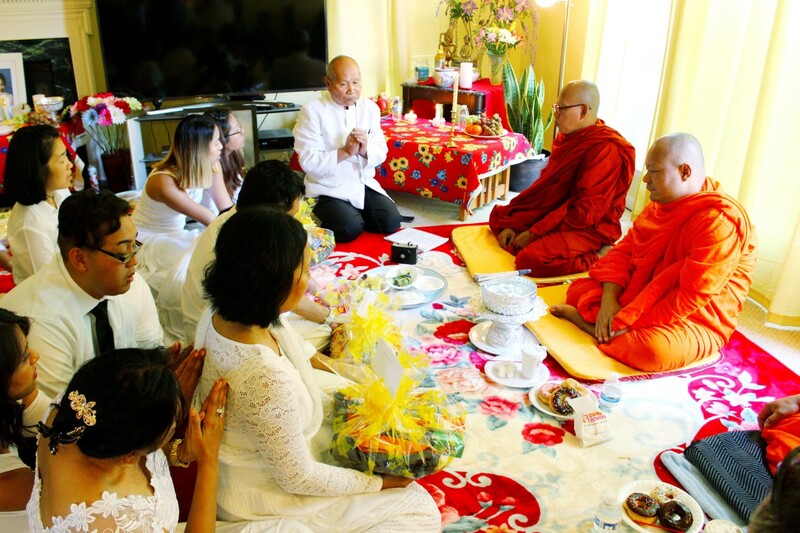 In order for these stages to occur, Cambodians carry out rituals in the Buddhist tradition. If the rituals aren’t adhered to, Cambodians believe the deceased will not move onto the next stage of the cycle – rebirth. Monks play critical roles in helping the departed to move onto the next life. They perform blessing ceremonies at births, weddings and times of sickness. When someone is dying, a monk will be called to the bedside in order to prepare them for the next life. Most Cambodians want the monk to remain until the person has departed because they believe this is when the soul leaves the body and lingers for a while. The family believe the monk will help calm the soul after the confusion of the death. A special ceremony known as Prachum Bend is celebrated for 15 days in September or October. Cambodians believe that some souls, because of bad karma, are not able to be reincarnated. Each year those souls are released to search for their living relatives, meditate and repent. People go to the temple and make an offering of food to their ancestors and other trapped souls who have no living relatives. Cambodians also have superstitions regarding death, including a belief that animals should be kept away from the deceased. It is believed that if the deceased hears an animal cry, their soul attaches to that animal. Another superstition is that a cat mustn’t be allowed to jump over the body. If one does, the deceased’s soul becomes an evil spirit and doesn’t enter the rebirth cycle.